Airway epithelial cells were first considered as a barrier to the inhaled environmental bioparticles, but recent evidences show that they have a more vital role to play in the pathophysiology of Airway diseases. Many of the factors present in the inhaled air interact with the receptors expressed on the epithelial cells leading to their activation. Activated epithelial cells then secrete a range of mediators that help in mediating the inflammation. These mediators contain the chemokines that act as chemoattractants and recruit inflammatory cells like neutrophils, macrophages, mast cells, eosinophils, and Th-2 cells that further exacerbate the intensity of inflammation. Some of the inhaled substances like protease enzymes can also disrupt the barrier of epithelium and gain an entry to the immune cells of the body leading to their activation. Bronchial asthma, chronic obstructive pulmonary disease, and acute respiratory distress syndrome represent a broad range of conditions involving pulmonary inflammation. 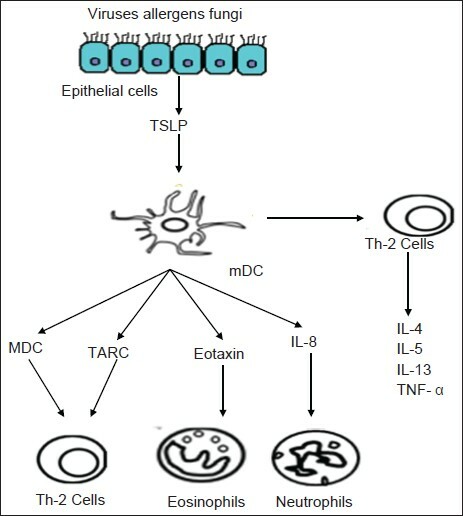 This review takes into account the role of epithelial cells in initiating allergic reactions at mucosal surfaces. Allergen Specific Immunotherapy (ASI) in the form of subcutaneous route (SCIT) used over a century and is currently under used for management of IgE mediated allergy disorders. SCIT Meta analysis showed very promising results and sustained effect for a long period from 7 years to 12 years on stopping the therapy. The adverse events are not common and application for day to day practice currently restricted among trained physicians. Allergy prone subjects adherence to SCIT is very less and drop outs are more either due to invasive injections, the long term dosage, cumbersome to wait at the clinic after the injection or due to local and systemic reactions. Alternate route suggested by WAO, ARIA and EAACI is Sublingual (SLIT) for better compliance and to increase the adherence of the therapy. SLIT Meta analysis showed its efficacy is equivalent to SCIT with mild to moderate tolerable adverse events without discontinuation of dosage schedules.SLIT becomes successful in the hands of trained physicians who initiate the effective dose for effective response which is crucial. The quality of standardised allergen extracts and the appropriate dose is to generate clinical response is very important. Selection of allergens for therapy by taking care of proteolysis which degrade in combination of heterogeneous allergens and time of administration is very critical. SLIT is friendly with children less than 6 years, SCIT restricted below 6 years. SLIT in the form of drops, tablets and Stripe is currently used and SLIT kept below the tongue before food for 2 to 5 minutes and swallow. The prescribed tailor made dosage consumed on daily basis at a regular time shows better results. At present the SLIT is a personal Medicine. SLIT is popular among European countries and US FDA is in the process of evaluation of clinical trials. Food hypersensitivity is estimated to be approximately 2% in adults and 8% in children. The incidence of perceived adult food hypersensitivity varies (1.4-30%) largely across the different countries. Allergen sensitization in different countries may be the result of interchange of genetic factors, cultural and dietary habits and or exposure to new allergenic products early in life. The diagnosis of food allergy is difficult due to lack of definitive laboratory test. The clinical observation is very important. The diagnosis and confirmation of adverse reaction to specific food should initially involve obtaining a good history of symptoms that may indicated the presence of food related adverse reaction. The diagnosis is confirmed by double blind placebo controlled food challenge test, which is difficult and may have sever reaction. Hence this test should be done in the hospital set up where the facilities to treat the allergic reactions are present. Introduction: The loss of body mass leading to cachexia is known to exist in chronic obstructive pulmonary disease (COPD). However, the role of body composition in asthmatics has not been widely explored. Materials and Methods: Body weight (BW), body mass index (BMI), percentage of ideal BW (PIBW), fat mass (FM), fat free mass index (FFMI), and midthigh cross-sectional were evaluated in COPD (n = 40) and asthma (n = 40) and compared with 20 healthy controls. Socioeconomic status served as a marker of dietary adequacy. Results: Weight (P < 0.001), BMI (P < 0.01), FMI (P < 0.05), and FFMI (P < 0.001) differed significantly among socioeconomic classes. Significant intergroup differences of weight and FFMI in the upper (P < 0.05) and BMI and PIBW in the upper-middle class (P < 0.05) were seen. BW in COPD was lower than bronchial asthma (BA) (P < 0.001) and controls (P < 0.001). BMI in COPD was lower than BA (P < 0.000) as were PIBW (P < 0.000) and FM (P < 0.001), whereas neither study group differed from controls. FFMI in COPD was lower than BA (P < 0.004) and controls (P < 0.01). No parameter differed between BA and control groups. Comparing by severity of airflow obstruction, all parameters were reduced in COPD, but statistical significance (P < 0.05) was noted for BMI and FFMI in mild/moderate cases and weight, BMI, PIBW, and FM in severe/very severe cases. No significant differences were noted when assessed with respect to severity of either disease. Correlations were noted between FFMI and post bronchodilator forced expiratory volume in the 1 st second (FEV) 1 (r = 0.342) and weight and post bronchodilator FEV 1 (r = 0.322) in COPD. Conclusion: COPD produces malnutrition with regards to both fat and fat free components, irrespective of the severity of the disease, whereas asthma bears no such association. Background and Objective : Food intolerance is an adverse reaction to food in which there is no involvement of defense (immune) system. There is some evidence for the use of food-specific immunoglobulin G (IgG) levels as a guide to identify food intolerance. 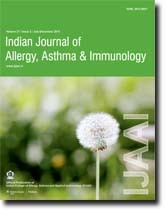 The current study was thus planned to study the prevalence of IgG-based food intolerance in bronchial asthma (BA) patients and healthy controls in Indian population. Materials and Methods: A total of 65 subjects were recruited for the study comprising 50 cases of BA and 15 healthy controls. These were assessed for food intolerance using specific IgG against selected food items. The results were graded as specific IgG against the selected food item: >30 U/mL - elevated and <30 -normal as per manufacturer`s recommendation. Results: The BA group had highest food intolerance against the vegetables, whereas in control subjects the food intolerance was highest for nuts. 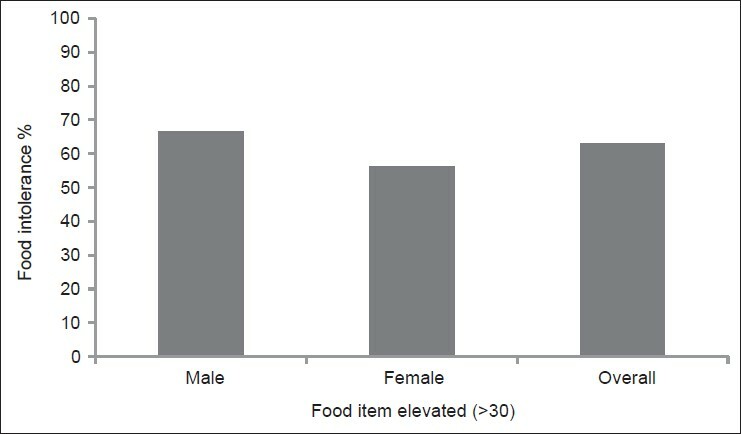 The prevalence of food intolerance was higher in male asthmatic patients, but in the control group females showed higher intolerance. The common food items to which food intolerance test was positive in descending order were cow milk (56%), casein (48%), tiger nut (48%), almond (46%), amaranth (46%), peanut (46%), soybean (44%), alga wakame (44%), scallop (44%), mulberry (42%) in asthmatic patients and almond (80%), cowmilk (73%), casein (66.6%), peanut (60%), cashew nut (60%), tiger nut (53.3%), carrot (53.3%), flax seed (53.3%), quino (53.3%), clan (53.3%), sunflower seed (53.3%) in control subjects. Conclusion: The specific IgG is a test to evaluate food intolerance. The common food items to which food intolerance test was positive in descending order were cow milk (56%), casein (48%), tiger nut (48%), almond (46%), amaranth (46%), peanut (46%), soybean (44%), alga wakame (44%), scallop (44%), mulberry (42%) in asthmatic patients. Background: Substantial proportion of the economic cost of asthma care is due to hospitalization and emergency department (ED) visit. The objective of our study was to identify the role of frequency of asthma symptoms and drug utilization as risk factors for asthma related hospitalization and ED visit among adult patients in selected hospitals in Nigeria. Patients and Methods: We carried out a cross sectional study of a sample of adult patients in selected hospitals in Nigeria. Demographic, clinical information, and use of asthma medications were obtained from the patients that were hospitalized or visited ED and those not hospitalized or visited ED in previous 12 months. Results: A total of 102 patients participated in the study. Fifty (49.0%) of the patients were hospitalized or visited the ED and 52 (51.0%) were neither hospitalized nor visited ED. Asthma patients who experienced frequent nocturnal symptoms (relative risk (RR)-3.50, 95% confidence interval ( C I) 2.05-4.96), frequent use of rescue medication (RR-2.89, 95% CI 1.66-4.12), increased daytime (RR-2.32, 95% CI 1.32-3.32), and nasal symptoms (RR-2.30, 95% CI 1.11-3.48) were more likely to be hospitalized or visited ED. Patients who used oral theophylline (RR-2.19, 95% CI 1.35-2.33) without doctor's prescription were two times more likely to be hospitalized or visited ED. The use of inhaled corticosteroids (ICS, RR-0.69, 95% CI 0.45-0.99) and oral corticosteroids (OCS; RR-0.73, 95% CI 0.00-1.59) were not associated asthma related hospitalization and ED visit. Conclusion: There is a need for pragmatic interventions in patients who reported increased asthma and nasal symptoms, increased use of rescue medication, and nonprescription use of oral theophylline in order to prevent acute asthma hospitalization and emergency visit. Background: Nasal airway resistance (NAR) is dependent upon the tone of the nasal vasculature, which is regulated by endothelially derived nitric oxide (NO). Aim: The aim of this study was to investigate the relationship between nasal nitric oxide (nNO) levels, NAR and atopy in patients of allergic rhinitis (AR). 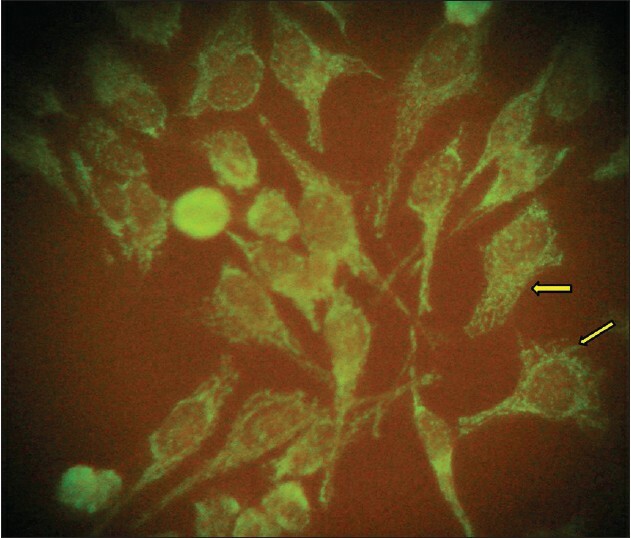 Materials and Methods: The subjects were assessed for nNO levels by NIOX chemiluminescence analyzer. NAR was measured by 4-Phase-Rhinomanometry using RHINOTEST 1000. Atopy was assessed by skin prick testing against 58 common aeroallergens. Statistical Analysis: SPSS, Chicago, IL, USA, statistical package version 14 using independent sample t-test and Pearson correlation Results: In the study, 15 diagnosed cases of AR and five healthy volunteers as control were included. In the control group, the mean total NAR was 0.16 ± 0.08 kPa/l/s while in AR group mean total NAR was 0.22 ± 0.1 kPa/ l/s (P = 0.4). In AR group mean left and right NAR were 0.50 ± 0.28 kPa/l/s and 0.52 ± 0.4 kPa/l/s respectively and mean nNO levels of right and left nostrils were 291.2 ± 122.90 ppb and 251 ± 171.16 ppb (P = 0.7). No correlation was found between the left or right unilateral NAR and nNO levels, respectively. Similarly, no significant correlation of unilateral NAR and NO levels were found in the control group. Atopic AR patients had higher NAR (P = 0.001) and nNO (P = 0.06) compared with non-atopic rhinitis patients. 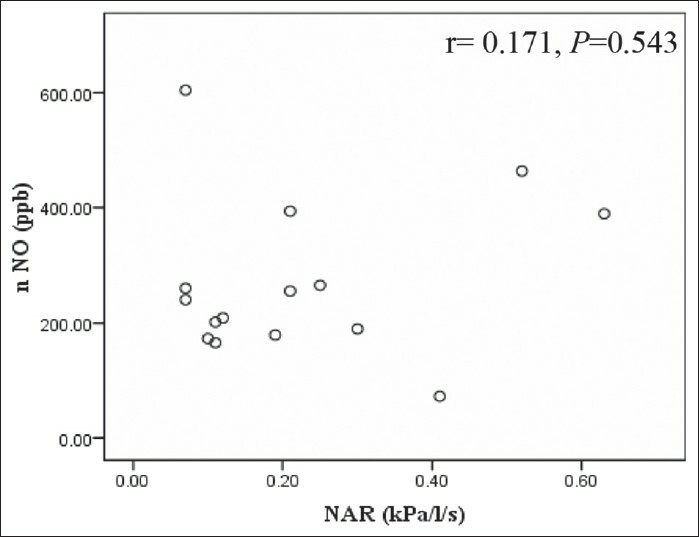 Conclusion: In our study, AR group had higher NAR, but no correlation was found between nNO and NAR in either groups. The atopic AR patients had significantly higher NAR in comparison with non-atopic patients. Both celiac disease and primary biliary cirrhosis share several features, including a higher prevalence in females, autoimmune comorbidities and specific autoantibodies. We report such a case in a male, with symptoms of chronic diarrhea and marked weight loss. A high level of suspicion of autoimmune disease, autoantibody assays and biopsies helped in a quick diagnosis and management. At 3-month follow-up, the patient had gained 3 kg. Reciprocal screening for both diseases is recommended, as an early diagnosis with the appropriate treatment can improve the outcome of these patients. Adenoid cystic carcinoma (ACC) is a rare primary tracheal malignancy. Hemoptysis, nonproductive cough, dyspnea, chest pain and weight loss are the common initial symptoms. Despite their rarity, their usually insidious onset often leads to a delay in diagnosis, making these potentially treatable lesions difficult to treat and often fatal. 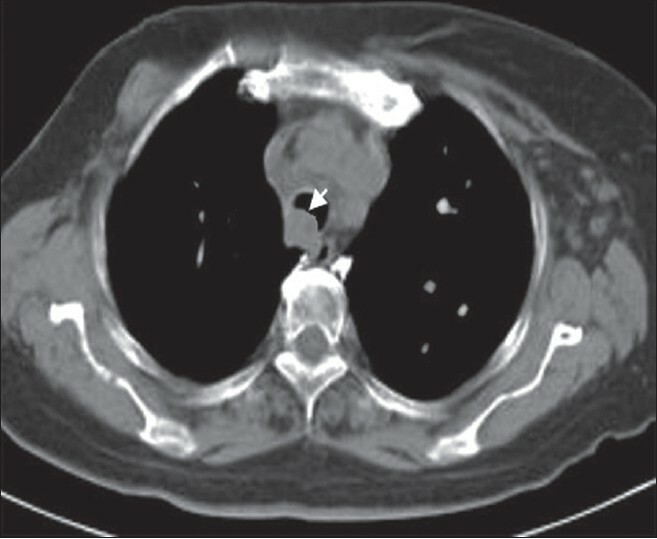 We present the case report of a 34-year-old male patient suffering from ACC arising from the right side of the trachea. The prevalence of bronchial asthma and allergic rhinitis has been on the rise in India. Cannabis is reported to be one of the allergenically important airborne pollen identified by the clinico-immunologic evaluation in the spring season in India. We report a case of 38-year-old male patient with typical clinical manifestations of bronchial asthma and allergic rhinitis that classically exacerbates during the pollination period of Cannabis. On evaluation, the patient was found to be significantly sensitized to Cannabis sativa. Subsequent subcutaneous immunotherapy leads to marked improvement in control of asthma as well as improved quality-of-life.